This time, many Twitter users sided with Rishi Kapoor on his opinion about IPL 2018 Auction. Rishi Kapoor who is known for his short temper on social media and blocking as many as 5,000 people on Twitter, has something very important to say this time. The Kapoor & Sons actor is making the news this time for standing for gender equality in sports. The famous faces from both Bollywood and business came under the same roof for 2018 IPL auction bidding. 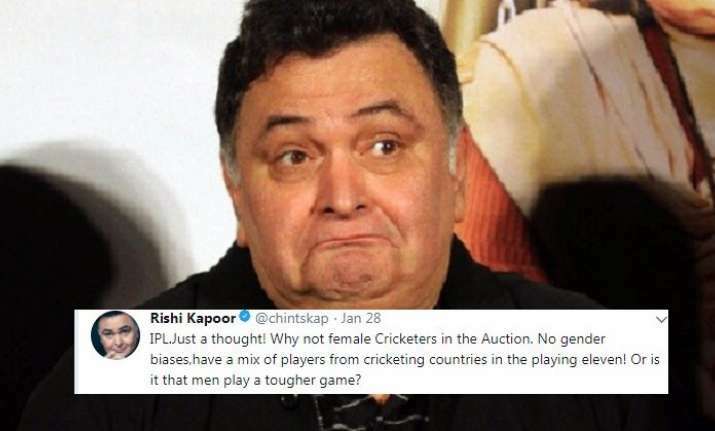 Meanwhile, Rishi Kapoor took to Twitter sharing his thought on why there were no female cricketers at the auction. His tweet got mixed reactions on Twitter, surprisingly, this time most of them backing the actor. Some even asked the actor if he was intoxicated while others sided with his opinions. Another Twitter user related his tweet to the character played by Rishi Kapoor in Agneepath, in which he auctioned girls. Filmmaker BVS Ravi sided with Rishi Kapoor on his opinion with IPL 2018. There were many who agreed with his idea of including women cricketers in IPL or at least having a separate IPL for them. Earlier, Rishi Kapoor revealed how handle the trolls on his social media accounts. He spilled the beans that so far he has blocked around 5,000 people on Twitter. On the work front, Rishi Kapoor will be seen with Amitabh Bachchan in 102 Not Out.